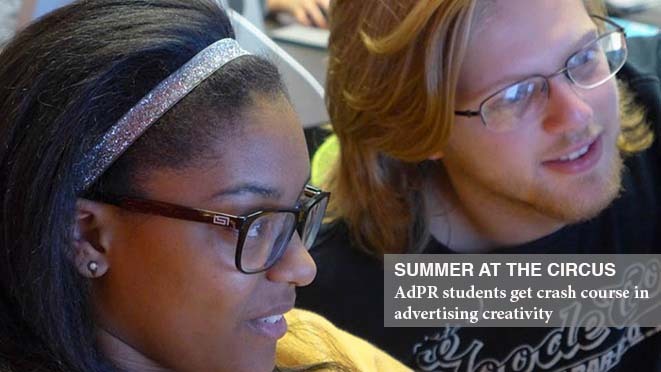 Nearly 30 students, half of which attend the University of Georgia, are spending their summer at a premier portfolio school in Atlanta developing their advertising creativity skills. Summer at The Circus is a partnership between The Creative Circus and the Department of Advertising and Public Relations in the Grady College of Journalism and Mass Communication. The program attracts students from around the country, including the University of Illinois, University of Tennessee and Florida State University. During the first two weeks of the eight-week program, which began on June 2, students completed the first set of two classes: “Idea Development & Creative Teams” and “Using Creative Suite Effectively.” Next up for the remaining two weeks in June are “Art Direction for Everyone” and “Creative Strategy & the Selling of Creative Ideas.” They will also visit the Fitzgerald & Co. agency and be hosted at BBDO Atlanta. In July, students will tackle “creative problem solving and concepting; game development; storytelling; packaging and marketing; (and) lighting, framing, & visual storytelling,” according to the program’s website. Matt Klugman, a UGA senior advertising major from Savannah, Ga., has previously interned in advertising sales, social media management, and internet market research, but really wanted to gain experience in creative. At Summer at The Circus, he says he’s been working his brain in ways like never before. “Our assignments have no boundaries and no rules,” he explained. “We are thrown into a sea of ideas and told not to drown. And honestly, I love it. “After my senior year flies by, I look forward to beginning portfolio school here at The Creative Circus as a copywriter,” he added. Rising UGA senior Savannah Bradford, an advertising major from Columbia, S.C., said the program is already exceeding her expectations. Students can earn up to six hours of upper-level elective credit through the program. To learn more about Summer at The Circus, visit www.summeratthecircus.com. You can also watch a video recap from summer 2013, the program’s inaugural year.